I always feel that there will hardly anybody who hates chocolate, unless they have some deficiency!!! Wait a minute, just because I love anything chocolaty, it is not necessary that everybody has to love it, right? Right!!! I am one chocolate person. Anything with chocolate in it, I am game. That very well explains why I have never been able to stick to my diet resolutions. I control quite a bit, and then a big bar of chocolate laden with hazelnuts or almonds comes my way and my resolution goes the opposite way. 🙁 I seriously am searching for my long lost will power to lose weight. Thankfully, since mom is around with me, she’s holding me back from baking for the time being. This is a super duper easy brownie recipe, cooked (cannot say baked!!) in the microwave. When you are craving for something sweet or if somebody is bothering you for a cake (like my brother did in this case! ), this recipe is one shot to take. It takes less than 15 minutes to put together, another approximately 3 minutes to be microwaved and 10 minutes to cool, and you have a brownie in hand! Melt the butter and chocolate till smooth by double boiler or directly on stove (ensure not to burn!) and allow to cool. Beat eggs and sugar till it is mixed well. Add the melted mixture, cocoa powder and baking powder and beat again to combine well. Finally add the flour and mix well with a spatula till no lumps are there. The batter will be quite thick. Grease a microwavable pan with butter. Pour the batter into the pan. Sprinkle all the nuts on top of the batter and spread well. Microwave on high for a maximum of 5 minutest till done. Mine was done in 4.5 minutes. Hi Rafeeda, thanks for taking the time to comment on my blog post, was really surprised because it came in just a few minutes after I'd posted…First of all, I absolutely loved the quote in your header..that is what I believe too :-)…you have a really interesting selection of recipes here and this brownie recipe is right up my alley! It's bookmarked now and looking to see more! Looks super delicious, good one dear. I like that you can make them so quick in the microwave! 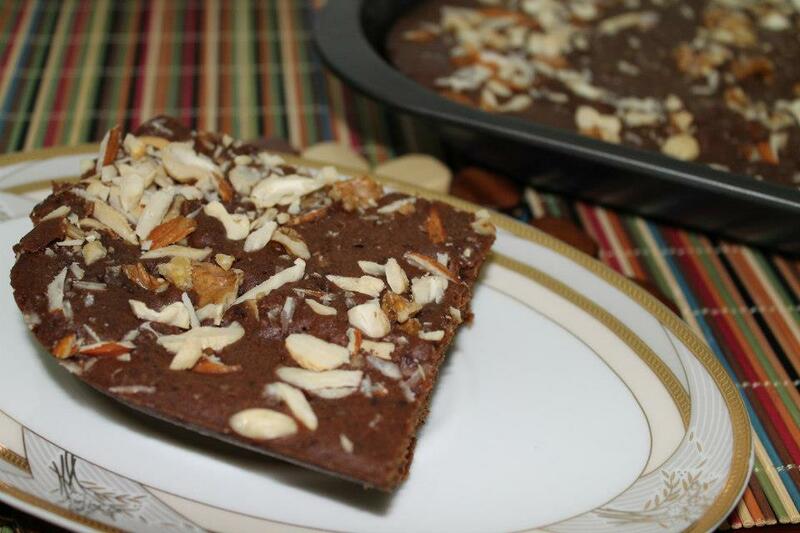 It's a really great idea to make brownie better with the nuts that you like! Awesome. Love the chocolate and nut idea. Will be a hit with hubby thanks to the nuts inside not so much with kids also thanks to nuts inside.